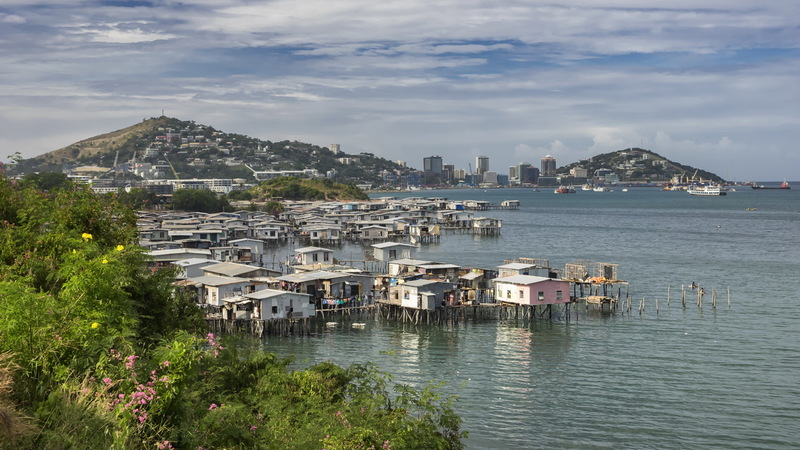 Hanuabada Stilt Village… Stilt houses, or pile dwellings as they are sometimes called, used to be very common in PNG’s capital Port Moresby. But times have changed and today there are only two stilt villages left – Hanuabada on the north-west outskirts of the city and Koki at the eastern end of Ela Beach. 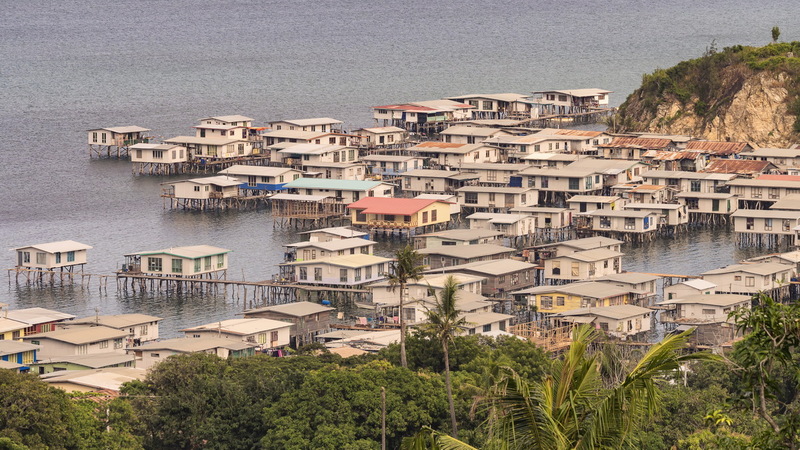 A third stilt village is located at Tubuseraia, just off the Magi Highway on the the southern edge of Bootless Bay, about 20km to the south-east of Port Moresby. Hanuabada means “great village” in the Motu language. The Motu are, together with the Koitabu tribe, the original native people of the Port Moresby area. The Motu were known as a sea-going people. They lived along the south coast of the main island of New Guinea. And were renowned for their annual hiri trading expeditions to distant parts of the Gulf of Papua. The hiri expeditions were conducted on large sailing canoes called lagatoi. These were multi-hulled rafts built by hand by lashing large logs together. 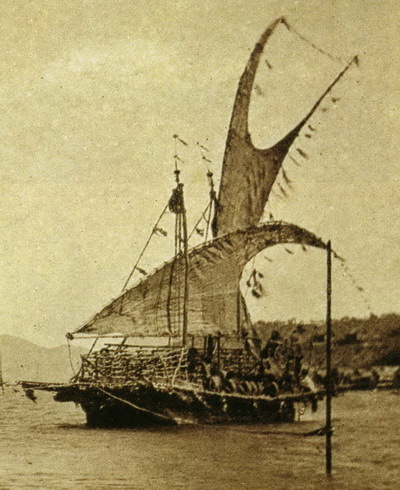 Their sails were claw-shaped and made from coconut fiber. A crew of thirty Motu men was required to sail each boat! The area of the south coast inhabited by the Motu is in a rain shadow with a harsh dry season. And so growing enough sago (their basic food staple) was very difficult. The Motu however were very skilled in making clay cooking pots, which were highly prized elsewhere. So the hiri trade developed. 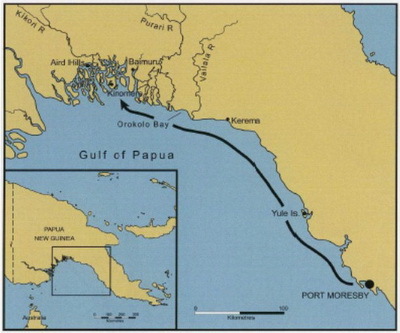 And each year the lagatoi sailing canoes headed westward in to the Gulf of Papua. Following the annual south-east laurabada trade winds and taking with them large quantities of clay pots which they would trade for sago. Their destination was usually a specific village in the Gulf where they were known and trusted from previous voyages. The outward-bound journey was usually uneventful because of calm seas, and only took about one week. On arrival the trading was done quickly, however the lagatoi could not return immediately. Because the crew would have to modify their boats by adding extra hulls to carry the bulky cargo of sago. Plus they needed the seasons to change and the lahara north-west trade winds to start so that they could sail home. It could take two to three months before the return journey began. And it was with much trepidation that the boats sailed as the lahara trade winds are known for heavy seas and big storms. Plus the boats were sailing with heavy cargoes which did little for their overall seaworthiness. But when the lagatoi canoes did return safely, it was an occasion for great rejoicing – known locally as moale. The annual Hiri voyages continued until the late fifties. When the Australian colonial authorities stopped them following the significant loss of life when a heavily sago-laden and storm-damaged lagatoi sank in rough seas. 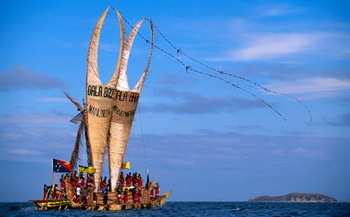 However a Hiri Moale Festival is now held in Port Moresby each year to celebrate this important part of Motu culture. 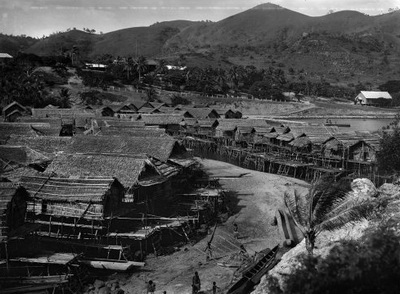 Physically located on the northern side of Port Moresby harbor, Hanuabada has a reputation of having retained much of its traditional and conservative Motu culture. The people are known to be friendly and welcoming. But Port Moresby can be a dangerous place… So you cannot just turn up there uninvited and expect to get a red carpet welcome. You will need to know, or hire, somebody from the village and be invited! The original stilt houses of Hanuabada were constructed from wood, with thatched roofs. But they were destroyed by fire during WWII and replaced using modern materials supplied from Australia. As a result Hanuabada has assumed a kind of “pre-fabricated” look… But being on the water has many advantages, such as a degree of natural air conditioning!